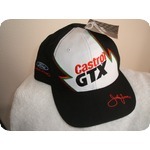 John Force Castrol and GTX new black ball cap with tags. Has his signature on the bill and in the rear johnforce.com and side FORD Racing. Has a rear adjustable strap. A collector's cap. Just a few left.